Hibs have received a boost in their bid to keep Dylan McGeouch at Easter Road with a potential suitor withdrawing their interest in the midfielder. According to West London Sport, QPR have decided against making a move for the 25-year-old, who is available on freedom of contract. The Loftus Road side were hoping to offload one of their existing midfield corps in order to facilitate the capture of the Scottish international, however they have so far been unable to do so. McGeouch has indicated that he wishes to move down south this summer after letting his contract at Easter Road expire. 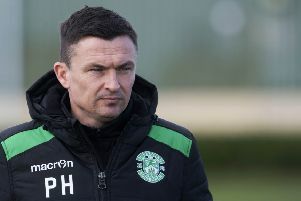 Although, he hasn’t ruled out a return to Hibs if the right offer doesn’t come along. Brentford and Blackburn Rovers have also been credited in an interest, while Aberdeen and Rangers have both previously been linked with the ex-Celtic youngster. McGeouch was voted Hibs’ player of the year at the conclusion of last season after he shook off injury troubles to have the finest campaign of his career to date. Meanwhile, Hibs today secured the signing of Florian Kamberi on a three-year deal. The Swiss striker impressed during the second half of last season after initially joining on loan from Grasshoppers.